Top Selling Agent for Resale Properties at ERA Preferred Properties in 1999, 2005 and 2006. I was the Top Listing Agent for Most Listings Sold and Highest Volume in 2016. I am excited to add your home to that list. 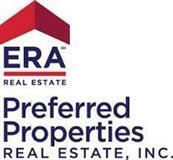 ERA Preferred Properties has been a consistent leader in their market in homes SOLD for a record 30 years. Leaders and volunteers in our communities and civic organizations. Sometimes, life can give you unexpected surprises. I realized one of those occasions when I was nationally recognized as one of 10 agents to be nominated for ERA's "Customer Satisfaction Award" in 2001. Imagine my surprise when I was again honored with the same recognition in 2004. Of course, I was only eligible for this award because my clients were kind enough to respond to the survey sent out after all ERA transactions. I appreciate my clients' response and will continue to represent their best interests when selling or purchasing property.